This entry was posted in Annotation, EquityUnbound. Bookmark the permalink. 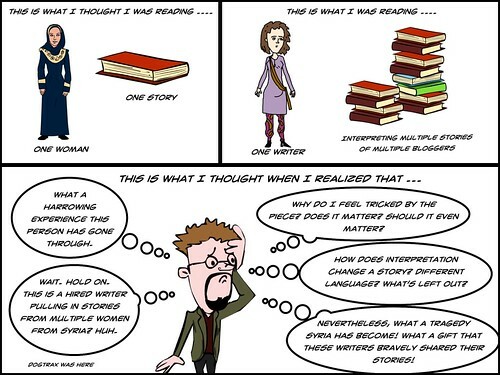 I looked at your cartoon and saw that you had a similar thought about the writer using first person narrative that mixed her perspectives with those of the women she was introducing via her translations and the article. I posted also a comment in the margins about this. I appreciate your efforts to do due diligence to verify the credibility of these stories. I’ve been following one Twitter account that is regularly posting photos showing the tragedy in Syria. For a while I was reTweeting and liking. Then I found another writer who was saying that much of this imagery may have been artificially created, to sway Western public opinion. Not being anywhere close to the situation and knowing who, if anyone, is telling the truth, I’ve become more reserved in how I look at the first account. Only by finding and following trusted writers, such as I’ve found via #Clmooc, can any of us build a sense of trust in what we are seeing on line. That’s sad. Thank you, Daniel, for your keen insights and for engaging, always. Appreciated.